All items of our Fall-Winter Collection 2011 located in the BLUE ROOM at PurpleMoon Main Store are dropping down its prices 40%!!!! 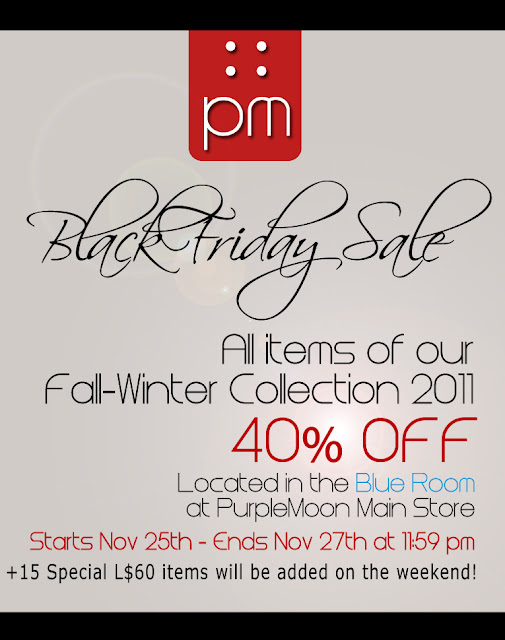 Everything at the BLUE ROOM can be found with a 40% OFF as a discount, starting right now (Nov 25th) and finishing on Sunday Nov 27th at 11:59 pm sharp! Also more than 15 special items will be added on the weekend for only L$60, keep an eye on those!